How will you describe living in NYC? I spent some time catching up on my Google Reader earlier and came across a GREAT article on Meg’s Mumbo. Even though I’ve only been in New York for about nine months now, this post seems to capture a lot about life, and moments, in the city. You’re close with the girl in the Lower East Side until she moves to Queens and falls off your radar. They talk about the moments when they felt most connected, when the city was giving them smooth handy J’s on a beautiful day and you were reciprocating by going down on it at The High Line. They talk about the reasons why they might leave—there are many and they all are valid—which invariably include the desire to have more space, more bang for your buck, and needing to make healthier lifestyle choices. 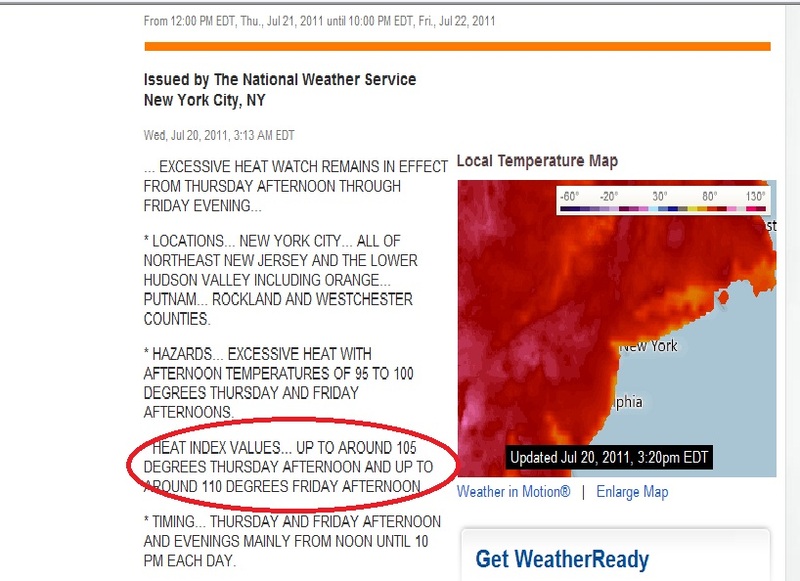 Check out the heat index for the next couple of days in NYC, ‘gonna be a hot one! Fortunately, my office is air conditioned, otherwise you’d find me doing one or all of the following…. going inside stores pretending like I’ll actually buy something but really just using them for their AC because let’s be real, with NYC rent there’s no room for me to buy that stuff. carrying around a roll of paper towels so I can wipe off all the sweat I leave every time I sit down, lean against, lie on etc. befriending people with pools. I’ll find them by phone hacking, that works, right? How will you stay cool?